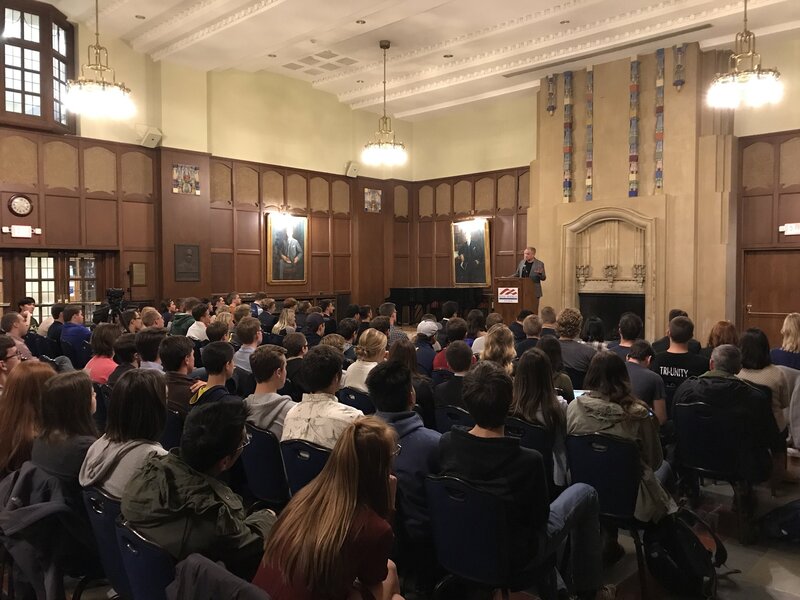 Last Thursday, on Hillary Clinton’s birthday, over 100 people packed the Michigan Union Pendleton Room to hear Lt. Col. Robert “Buzz” Patterson speak about “What Really Happened” in regards to Clinton’s candidacy. Patterson served as the former military aide to President Bill Clinton and carried the “nuclear football,” the informal name for the briefcase that allows the president to launch a nuclear attack. The event was hosted by the Michigan chapter of Young Americans For Freedom, a nonprofit, nonpartisan, educational organization dedicated to promoting conservative ideas of free enterprise, limited government, and a strong national defense to give all people freedom to thrive, according to the group’s Facebook page. Patterson, who lived in the White House, was with the Clintons through it all, including the Monica Lewinsky scandal and the Whitewater controversy. He began his lecture by talking about his years in college and how strange it was that sixteen years after marching against nuclear weapons he found himself carrying the “nuclear football” for the President of the United States. Patterson painted a grim picture of the Clinton White House, marked by corruption and constant bickering between the president and first lady. In one recount, Patterson said that Clinton could have helped prevent thousands of Kurds from dying in Iraq, but he refused to answer several phone calls and instead watched golf. Patterson described in detail the oftentimes fraught relationship between Bill and Hillary Clinton, noting that the two slept in separate beds. Their dysfunctional relationship was especially seen when the two were fighting in an elevator before an event. As soon as the elevator opened they held hands and waved to the crowd as if everything was fine, according to Patterson. “In that elevator, Hillary took out her anger on the president. She yelled at the president every bad word you have ever heard in your life,” Patterson said. And then came the Monica Lewinsky scandal. Patterson described the day that the scandal broke, stating that “Hillary became the president that day,” as she told her husband what to say to the press. Hillary knew about President Clinton’s relationship with Monica long before it was leaked to the press, according to Patterson. Patterson also claimed that Hillary penned the now infamous “I did not have sexual relations with that woman” line that President Clinton told the nation, which ultimately led to his later impeachment. The day the scandal broke, Clinton was so preoccupied that he forgot where he put the nuclear codes. Patterson said it was unclear whether the codes had been lost for days or months. “He was not quite the commander in chief I had expected,” Patterson said. Jacob Chludzinski, the president of Young American’s for Freedom at Michigan, thought the event was a great success. Yeah you’re really doing that by hosting someone who gleefully reveals the private dirty laundry of a married couple which he’s only privy to because his job required him to be there. What the hell does basking in the marital difficulties of a vanquished political opponent have to do with conservatism? How what’s wrong with these people that a year into the disastrous Trunp presidency they’re still obsessed with Clinton’s faults? Patterson is a vile scumbag and his audience are pathetic hypocrites.